The 1955-56 school year saw a full enrollment of 417 students in all four grades, state accreditation, the first junior-senior prom, and the first graduating class. The following year the North Central Association of Colleges and Schools accredited Regina, and the Queen’s Chapter of the National Honor Society was established. 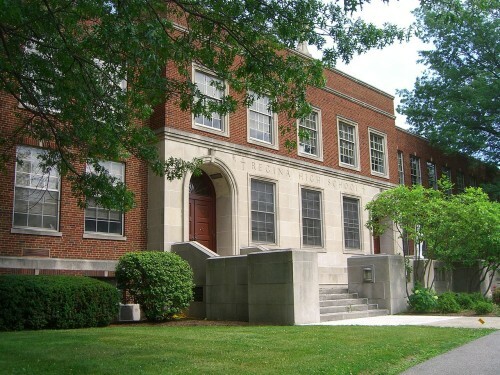 During the early 1960’s as enrollment increased, the facility was expanded with the addition of 20 classrooms in the south wing. Uniforms were adopted and lay teachers joined the faculty. In the spring of 1971, the 1,100 seat auditorium was added to accommodate the school’s peak enrollment. Throughout the 1970’s Regina students were active in community service, produced the first Prism yearbook, and participated in interscholastic athletics through the newly formed Greater Cleveland Catholic Girls Athletic Conference. The Alumnae Association began, producing a newsletter, social events, and ongoing support for the school. “We are family” was the theme of the 80’s. Clown Ministry began and the increased number of athletic teams sported the name “Royals.” The multi-cultural mix of students provided new opportunities to create a family spirit. Harmony Club, Gospel Choir, the German Exchange program, and African Dance promoted the appreciation of diversity. Regina’s recognition as Blue Ribbon School by the U.S. Department of Education in 1991 affirmed the school’s commitment to excellence. Regina celebrated its 40th anniversary by honoring 40 Women of Distinction. The Parent Association provided opportunities for increased parent involvement, and a strategic plan guided advances in curriculum, a focus on multiple intelligences, and the implementation of technology. A partnership with Notre Dame College allowed juniors and seniors to take college courses.